Eden Hazard is not the answer between now and the end of the season for Chelsea. The next two-weeks of the transfer window are vital for Chelsea and our top-four hopes because we MUST either sign a striker that can come here and hit the ground running, or look to bring back Michy Batshuayi or Tammy Abraham to replace the outgoing Alvaro Morata. Eden Hazard is NOT the answer. Eden Hazard is the main man at Chelsea right? He is the the outstanding talent we have and someone that can win games on his own. Someone viewed as one of the top-three players in the world right now just behind Lionel Messi and Cristiano Ronaldo right? So why on earth would you look to stifle that talent by playing him in a role that DOES NOT suit him or our team. Now before you say it, yes he played up front against Manchester City when we beat them at home and he had an assist for a goal. Apart from that he did little in the game. Against Newcastle this passed weekend, he was substituted as deemed ineffective! When would we ever expect Eden Hazard to be called that? #CFC All I am saying here is that we all know if Giroud started and Hazard played off him, Hazard would be running the show right now! As we know, Newcastle scored shortly afterwards for his to go in at half-time 1-1 and I was fuming which I wont show on here due to the language used! At half-time, we expected a change to bring Olivier Giroud on and for Eden Hazard to play in his natural position to finally dominate the game but it never happened. 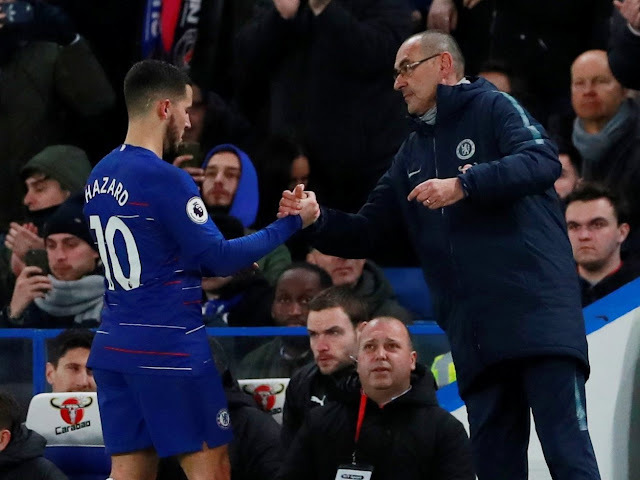 Hazard was asked to remain as the striker or further player forward in the false-nine and as the game moved forward he continued to half little effect on the game. As I said he was substituted which could play a part in the decision over his future this summer. Chelsea need a focal point up front. Chelsea play better with a focal point up front and its imperative that we have that for the remainder of the season. Is Gonzalo Higuain that person? Is Michy Batshuayi or Tammy Abraham that person? One thing is for sure, we need someone other than Eden Hazard to play there. To get the best out of Hazard, we need to play him wide left or in the number ten role. He is at his very best when he collects the ball in space with time to see his direct opponent in front of him, not with his back to goal when he is being man-marked. I cannot see why Maurizio Sarri does not see what I am seeing here and it's frustrating the life out of me. What do you think of Hazard in the false-nine? Do you agree with me or have a different opinion? The most concerning thing here at the moment is that it's seems that this has become the best option for the manager and the go-to formation. I expect the same again against Arsenal. Chelsea need another solution up front. Eden Hazard is NOT the answer between now and the end of the season.